Last night presented one of those moments that would unfold without us having a clue where it would ultimately lead. Thankfully, due to Cyndie’s willingness to run with it, we took a step that was long overdue. She transplanted some volunteer sprouts of oak and maple trees. It started with her walking the dog and me doing some work in the shop. I had the door open and some music playing. Suddenly, Delilah popped in to say hello. Cyndie paused to trim some growth around the vicinity. While pulling weeds, she discovered the saturated ground made it easy to pull out the new tree sprouts. We’ve been talking about transplanting trees for weeks, but never really formulated a plan on where they would go when we finally take action. Since she now had a stack of multiple beauties fresh out of the ground, it presented an urgency to decide on a new location for them. 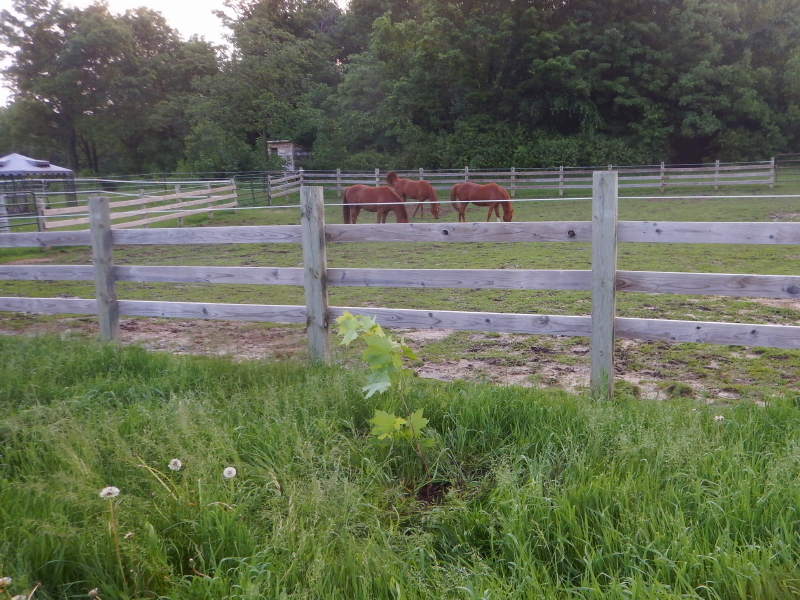 I honestly have no idea why I didn’t come up with this before, but it hit me in an instant that planting them just outside the paddock fence would someday offer a natural shade for the horses inside the fence. So, that’s what Cyndie did. It will require some care to give these babies a fair chance at survival, but given the vast number of new sprouts showing up every spring, we will always have plenty of opportunities to try again, in case of any failures. This is another thing that I would love to have done years ago, to have already taken advantage of that time for growth. The shade I’m looking forward to could be a decade away, to get the trees tall enough and filled out enough to cast a useful shadow. It’s like our story about growing our own asparagus. People told us that it takes at least three years after planting to start harvesting stalks. For some silly reason, that information repeatedly caused us to not take action. Inexplicably, our response to something that required waiting a significant amount of time for results was to do nothing. Over and over again. After three years, I mentioned that if we had just planted some when we first talked about the possibility, we could be harvesting already. Then Cyndie came across the brilliant idea of not planting from seed, but buying a 2-year-old plant and burying it in the ground. We are learning to get out of our own way. In this regard, the spontaneity becomes our secret weapon. We will always get more progress if we just do it, and not wait for the “perfect” plan. We need to not worry so much about the possibility of failure. My old mode of thinking involved not wanting to work hard on planting trees if they are just going to die, but I’m getting over that now. Maybe the four tries to succeed in the center of our labyrinth have softened my resistance. We transplanted this group yesterday without any planning or preparation. I have no idea what the result will be, but at least we have taken the required first step, thanks to Cyndie’s adventurous spontaneous effort.